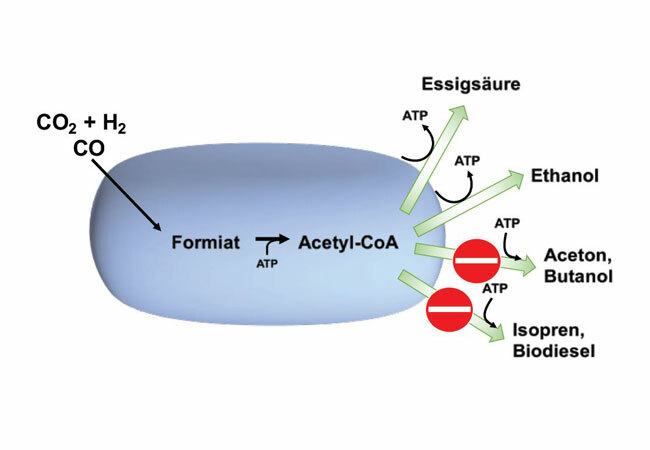 Acetogenic (acetic acid-producing) bacteria produce acetic acid or ethanol from H2 + CO2 or CO. Energy is released in the form of ATP (adenosine triphosphate) in the process. The synthesis of other products interesting for industry from the intermediate product acetyl-CoA, however, also uses up ATP. The aim of this project is to alter the energy balance of the bacteria by means of genetic modification in such a way that the production of such energy-consuming compounds will also be possible.